I started down this path with the idea that having 2 years worth of cash as a buffer from a bear market is enough. In a lot of the articles that I read about, one of the advice that was often given is that, to mitigate the issue of sequence of returns risk is to have a 2-5 years of cash holding. Most of your wealth for retirement, financial independence or financial security are allocated in financial assets that are subjected to market volatility. Depending on your luck, you might encounter a positive or negative sequence. The image above illustrates this. Both portfolio A and B’s compounded returns at the end of 21 years is the same. The difference is in the sequence of returns within those 21 years. 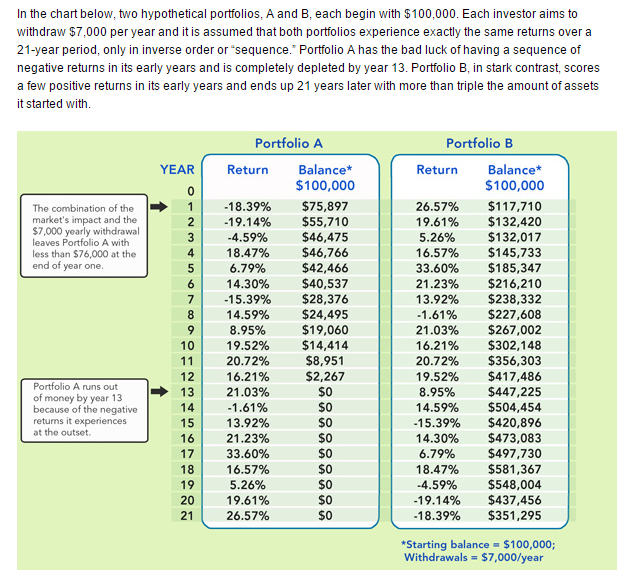 Portfolio A has more negative years in front while Portfolio B’s negative years is at the back. Both retiree is withdrawing $7000/yr from the portfolio. Portfolio A got depleted while Portfolio B was able to last for the whole 21 years. Portfolio A is an example of a negative sequence. If this draw down happens at the start when you need to withdraw your money, rather than near the end, your wealth cannot recover to its original amount, and therefore your wealth cannot last as long. In contrast, if the bear happens at the end of when you need it, the preceding bull would have grown your wealth much more that, factor in this bear market later, you would still have adequate or even more than you need. With a cash buffer, it allows you to draw on this cash buffer, leaving the portfolio intact. For example, like the above example, you can have $14,000 cash buffer or 2 years of your expenses saved up. In the case of Portfolio A, instead of drawing down your portfolio, you can spend from the cash buffer. In this way the portfolio is untouched and it can do its best to recover to previous level. This sounds good in theory, but in actual implementation it has its flaws. I came across this article by Abraham Okusanya called Cash reserve buffers, withdrawal rates and old wives’ fables for retirement portfolios. It is a research from the global equities and bonds perspective, its not too long and very research based. And I think the results would help us craft a better plan. So I wrote this article to collect some of my thoughts. There are many people who came up with different cash buffer approaches but what this article does is to study 11 different approach. Withdraw evenly across all asset class. Rebalance once every 2 years. Here is my interpretation of his results. The withdrawal rate is fixed at 4%, and so is the starting amount of 100,000 pounds and equity/bond allocation. We can observe that the longer you need the money the % probability of success, or you have at least $1 at the end of each period is reduced. The first thing is that when the order of withdrawal is rather fixed, whether you re-balance annually, once every 2 years, or when the allocation is 5% or 10% out of alignment, it does not make much difference. In the worst case, portfolio last 15-16 years. The 10th percentile or the lowest 10% last between 20-22 years. Another important point, is found on the right section of the comparison. Instead of the even withdrawal schemes, those withdrawal schemes that withdraw predominately bonds first perform much better. This includes withdrawing last year’s worst asset class, which typically is bonds since the asset class that does comparatively worse are usually bonds. This is also a rising equity glide path, which is to systematically increase the equity allocation. Micheal Kitces wrote an article explaining why this is better, if you want your wealth to last longer. In those withdrawal schemes, by not re-balancing, and withdrawing the worse or even asset class (typically bonds), it allows the equity allocation to naturally increase. The worse performing are the withdrawing equity first and last year’s best performing years (both short equities). The results are drastically worse. However, quantitatively, the worst number of years the wealth lasted and the 10th percentile is not that far off from those even withdrawal. It is just 2 years less. Now what about if we allocate a cash buffer to it. If we compare this to the previous table, the success rate for 35 years is less (average 71% vs 76%). So is the success rate for 40 years (56% vs 70%). You will also have less balance at the end of 30 years. The worst and 10th percentile is pretty similar to the previous table. The key difference is that you take 10% of equity and move it to cash. It is a drastic reduction in overall wealth growth rate. Abraham mentioned that for some of us, we really wish to have that peace of mind of a cash holding, replace the bonds with cash instead of equities. The success rate is better if not comparable to the 50/50 equity and bond allocation. In this way we will not kill the growth rate. This research might invite the inevitable question that, if I see a bear market soon, should I still remain in 100% equity or high equity allocation? You need to be aware that the researchers needed to make certain assumptions, and one of these assumptions is that the wealth is deployed into passive index funds or exchange traded funds (ETF). This way, it makes the simulation possible and some systematic results can be achieved. The conclusion of the results show that you need a high enough overall rate of return, relative to your initial withdrawal rate. For example, if your overall rate of return, in nominal terms is 7%, then you might only accommodate a withdrawal rate of 3.5%. However if your overall rate of return is 5%, then your withdrawal rate, to be safe, should be less than 2.5%. If your approach is an active based wealth building such as active individual stock investing, then you need to ensure that you can deploy a 70% stock, 30% cash allocation. However, You need to ascertain that your competency allow you to achieve a high overall equity portfolio like rate of return. When you have a high equity allocation, your returns tend to be more volatile. Thus, the safe initial withdrawal rate is lower. You might need a systematic personal action script to facilitate a variable withdrawal strategy to tackle the volatility versus your spending needs. 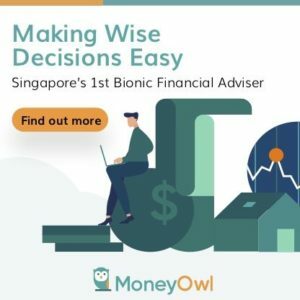 However, if you are not using a volatile asset class like equity, but something more predictable, such as annuity, the volatility is lower, your initial safe withdrawal rate can be higher. So you need to know the nature of what you know in your retirement well. Each of us would have our own plans. This can be financial independence, financial security or total retirement. This plan is not bad, in that for some time, I do know that having too much cash on the portfolio is a drag on the return. However, there are justification to have a heavier cash holding, based on trying to avoid the negative sequence of return risk. The enlightenment that I have for this article is that I got mixed up with the implementation of the rising equity glide path and re-balancing of portfolio. By spending on the asset class that performed the strongest, it sounded rational but if equity outperforms cash and bonds most of the time, I will have a greater bond or cash allocation than equity over time. And this contrast to the rising equity glide path idea. The testing with global equities and bonds show that the frequency of re-balancing or even the existence of re-balancing will improve how long your wealth will last. I am incline to withdraw from the bonds or cash portion and let the equity allocation grow. Finally, since my original target was $500,000 and I manage to expand my wealth to likely $900,000, it is as if the portfolio went through a bull run, before the possibility that the bear run will reduce it closer to $600,000. I would have lived through a favorable bull then bear regime. If I implement this together with the rising equity glide path, things should look pretty good. In the end, the reality is that while cash reserve strategies appear psychologically appealing, their actual benefits as an enhancement for retirement income sustainability appear to be a mirage upon closer inspection. The buffer zone approach appears to do little to effectively “time” the market, and/or to the extent it does, the benefits are overwhelmed by the adverse consequences of a large allocation of cash in the portfolio that drags down long-term returns. Notably, though, separate research has shown that shifting equity exposure in light of market volatility (and based on fundamental valuation principles) can in fact enhance both returns, risk-adjusted returns, and the sustainability of retirement income – and without the unfavorable impact of an unduly large cash position. – Research Reveals Cash Reserve Strategies Don’t Work… Unless You’re A Good Market Timer? Many financial planners recommend holding cash equal to 2 years’ withdrawals to draw on when your investments are down. The idea is that after a significant down year, you can live off the cash and not touch your investments, to give them some time to recover. In every case, holding cash either had no effect or increased the risk of running out of money. I could not find a single example of a retiring year or withdrawal amount when holding any amount of cash provided a higher success rate than holding no cash. The study showed that holding cash does not protect you. In fact, it often increases your risk of running out of money. – How to Reliably Maximize Your Retirement Income – Is the “4% Rule” Safe? Despite these case study, there will still be retirees who believe in the virtues of having cash allocation. This is because there are certainty there. My job here is show the evidence of what might work better. It is up to you to implement your own wealth withdrawal plan. It is a bit jumbled up and I would clean up one of these days. But if you wish how I came to this current plan, it is a good linked article to read up.